Enjoy your shopping experience @ Good Life! 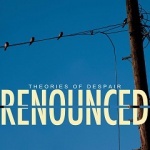 Order the brand new RENOUNCED (UKHC) 'Theories of Despair' Full length Cd on Good Life Recordings right here ! Click cover to listen !